As a young woman, Sister of St. Clare Briege McKenna was miraculously healed of rheumatoid arthritis. 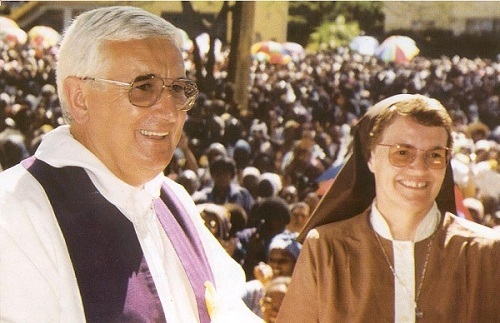 Not long after, she received the gift of healing, and began a ministry to Catholic clergy and laity that has spanned four decades and five continents. But Sister Briege learned long ago that the deepest healing is that which can’t be seen by the naked eye. That is the healing of the soul, and it comes to us first and foremost through the sacraments. In her newest book, “The Power of the Sacraments” (Servant, $9.99), Sister Briege calls Catholics to rediscover the sacraments and encounter their healing power. Recently, Our Sunday Visitor spoke with Sister Briege about her new book and the need for healing in the Church today. Our Sunday Visitor: Why do you think Catholics sometimes tend to take the sacraments for granted? Sister Briege McKenna: I think that’s because many don’t really understand the power of the sacraments. The greatest need in our present day is for people to be in-structed in the faith and to be taught what the sacraments really are. Catholics need to be evangelized about their own faith and beliefs. OSV: And where does that evangelization begin? Sister Briege: It begins by showing people how the deepest needs they have are fulfilled by the sacraments. Take, for example, the Sacrament of Reconciliation. In today’s world people feel a need to unburden themselves, to confess. But they’re going to all the wrong people to do that: hairdressers, psychiatrists, strangers on the Internet. I can’t tell you how often people tell their sins to me on airplanes. But I can’t absolve anyone of their sins. Nor can a hairdresser. They’re confessing, but they’re not going to the right place. They’re not going where they can find real freedom. The same is true for the Eucharist and the anointing of the sick. In my ministry people come to me all the time looking for miracles. But do you know how many miracles I’ve seen through those sacraments? After people receive the Eucharist or the anointing of the sick, so many begin to get better. And even when there’s not physical healing, there’s healing of a different sort. The Lord is on the altars of the world. If Catholics really understood that, they would crawl to Mass. OSV: That understanding isn’t just an intellectual knowledge, is it? Sister Briege: No, it’s not. I say to priests all the time that they need to pray for the charism of understanding. That’s true for all Catholics. Understanding is a charism of the Holy Spirit that helps us grasp the mysteries of the faith with our hearts. That’s what enabled the martyrs to give their lives. Many martyrs had different degrees of intellectual knowledge, but they understood the mysteries in their heart, and they died because of that. OSV: You just mentioned in passing the work you do with priests. That’s been a primary focus for you in recent years. How did that start? Sister Briege: It actually began not long after my own physical healing. I came to Florida in 1971 as a young nun. I’d grown up in a very devout Catholic culture, and we’d been taught never to criticize priests. I remember my father telling us stories about how we should honor them. And we should, of course, but many of us were doing it in the wrong way, putting them up on a pedestal. Well, in 1971, that was changing, and I found myself, like many, becoming quite critical of priests. One day, I went into the chapel and asked God, “What’s wrong with these priests?” He then revealed two things to me. First, he showed me that a tremendous crisis was coming, a crisis that would lead to a great famine of the Word of God, and that Catholics would turn away from the faith. OSV: And the second thing? I was horrified. But I wrote it all down and talked to my bishop. Shortly afterward, I got an overwhelming love for the priesthood, a real sense of what the Sacrament of Holy Orders was. Then God brought Vincentian Father Kevin Scallon and I together. My mother general and his father general gave us their blessing and sent us out to work together. And ever since we’ve been going wherever we’re invited to help priests rediscover the spirit of their priesthood. OSV: Some of the priests with whom you work are priests who have fallen into serious sin. As you’ve gotten to know these priests, what have you discovered about the circumstances that led them to where they are now? Sister Briege: They didn’t get there overnight. Their struggles are generally the fruit of a long and slow neglect of the spiritual life. We all have an inner and an outer life. That inner life starts at baptism, and, in this world, it’s constantly under attack. So we have to protect it. How do we do that? We make our home in Jesus. We nourish it though prayer, sacraments and living the life we’ve promised Jesus to live. If a priest isn’t doing that, if he’s not giving over every area of his life to Jesus, he neglects the inner life, and divorce comes. He begins to care only for his outer life. And he falls. The priesthood is God’s gift. And any gift that is not cherished, that is not received and loved and cared for, dies. A priest can’t lose the gift of his priesthood, but he can lose the love that animates it. And that can cost him everything. OSV: How has a wrong understanding of celibacy contributed to that fall? Sister Briege: When a man is called to the priesthood, God doesn’t take away his sexuality. It’s normal to be attracted to another. And, as Pope John Paul II writes in his first letter to priests, the Lord has every right to challenge us. We’re not guaranteed freedom from temptation. What we are guaranteed is the grace of God. That grace can help us understand that celibacy is not a denial of human love. Celibacy is a consecration of your most precious gift of sexuality to Almighty God. You offer it to the Lord. And you take time to discern if that’s an offering you can make. When you make it, God consecrates the gift of your sexuality and gives it back to you with a new power. But you have to both understand that you’ve given it freely — it’s not something that’s been taken from you — and that you have to choose every day to remain faithful, just as a married person does. OSV: There’s so much sin, shame and pain in the Church right now. How do Catholics make sense of it all? Sister Briege: First, we have to pray for those who’ve suffered at the hands of priests. But we mustn’t let one priest’s sin, or even many priests’ sins, keep us away from the Church. When we do that, we commit spiritual suicide. When Judas betrayed Christ, the disciples didn’t stop what they were doing and focus only on him. They found a replacement, Matthias, and continued with the work of the Church. I’d also add that we must not forget that all priests who are accused are not guilty. I know many saintly men who have been falsely accused and are suffering horribly because of lies that have been told. OSV: From what you’ve seen with the priests with whom you work, do you believe better days are ahead? Sister Briege: I do. God is rectifying what’s happened. He’s cleansing the Church. And we’ve been so blessed to have such holy popes in our lifetime. It hasn’t always been like this. But the Church survived, and now we have a great pope leading us into a new springtime. Before we see the fruit, there has to be purification, and the ground has to be fertilized. But the springtime is coming. The Church has been humiliated, and that’s good. The prestige of the priesthood is no longer an earthly one. We’re looking more closely at who’s forming our priests and how. Some bishops and priests are finding their voices again. They’re less afraid of speaking with authority. We need more of that, though. All bishops and priests must be willing to speak out and defend truth and the Church’s moral teachings. They must not be afraid to confront sin, even if it means martyrdom. Copyright © 2010, Our Sunday Visitor, Inc.